Are you going to the first ever Candy Style Awards? So finally! 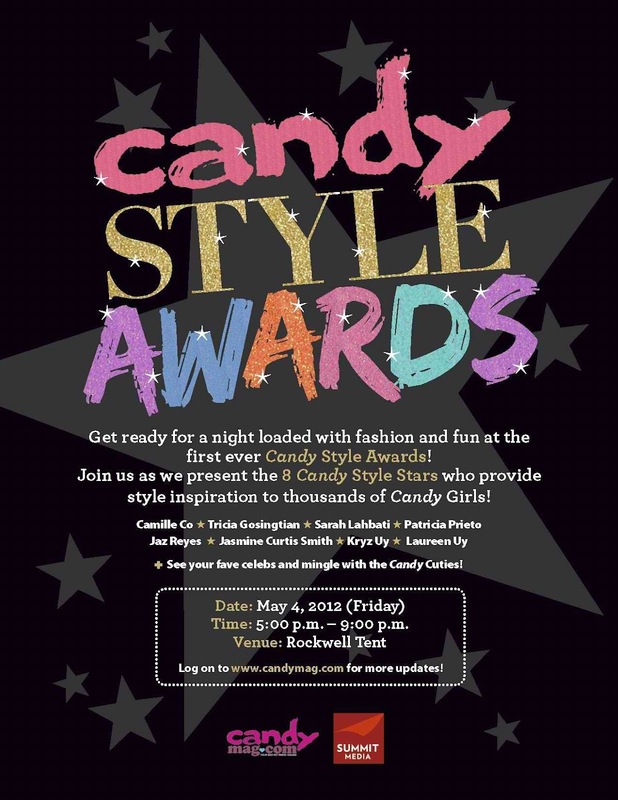 - Get ready for a night filled with fashion, fun, celebs, and Candy Cuties as Candy magazine stages its first-ever Candy Style Awards! Happening this May 4, Friday from 5:00 PM to 9:00 PM at the Rockwell Tent, the Candy Style Awards will present the first batch of Candy Style Stars: Camille Co, Tricia Gosingtian, Laureen Uy, Patricia Prieto, and Kryz Uy; actresses Jasmine Curtis-Smith and Sarah Lahbati; and DJ/Host Jaz Reyes. Plus, find out if your favorite celebrities made it to Candy’s Celebrity Style Stars list: the most Stylish Love Team, Stylish Candy Cutie, Junior Style Star, Stylish Sisters, Stylish BFFs, and most Stylish Cover Boy! So, dress up in your most stylish outfits, bring your BFFs, and get the chance to meet your fave Style Stars, and bond with the Candy Cuties! The May issue of Candy comes with a special coupon that serves as your ticket to the event. One (1) coupon admits one (1) person only and must be presented upon registration. Candy’s May issue will also be available at the venue entrance for purchase. Candy is available in bookstores, newsstands, and supermarkets nationwide. For more of Candy online, visit www.candymag.com, become a fan on Facebook via facebook.com/candymag, and follow us on Twitter via twitter.com/candymagdotcom. If Ivan Dorschner is a Candy Cutie, I AM SO THERE.